Who is the best goal scorer in NHL history? Three weeks ago I adjusted Alex Ovechkin’s goals to see how many he would have hypothetically had through the first 800 games of his career if he had played from 1979-89 (a high-scoring NHL era). I used a statistic I created called goal share per game and it provided some worthy insight. Now I’ve taken this stat a little further to explore some other great NHL goal scorers. Unlike before, I will also be adjusting for their games played in each season so we can get some more accurate numbers. The 15 players I focused on were: Wayne Gretzky, Mario Lemieux, Brett Hull, Gordie Howe, Mike Bossy, Alex Ovechkin, Maurice Richard, Pavel Bure, Phil Esposito, Marcel Dionne, Jaromir Jagr, Jari Kurri, Jarome Iginla, Bobby Hull, and Teemu Selanne. Let’s say Player A averaged 1 goal per game over his career, while Player B averaged 2 goals per game over his career. If that was the only information available, many people will obviously say that Player B was a better goal scorer than Player A. But, if I told them that Player A played his career in an era in which an average of 2 goals were being scored per game while Player B played his career in an era in which an average of 8 goals were being scored per game, they may re-consider. Goal Share Per Game = Individual Goals Per Game / Total Goals Per Game. Player A’s Goal Share Per Game would be 50% (1/2). Player B’s Goal Share Per Game would be 25% (2/8). It’s a simple formula that can help you compare different scorers with respect to the amount of goals that were being scored per game during the era they played in. 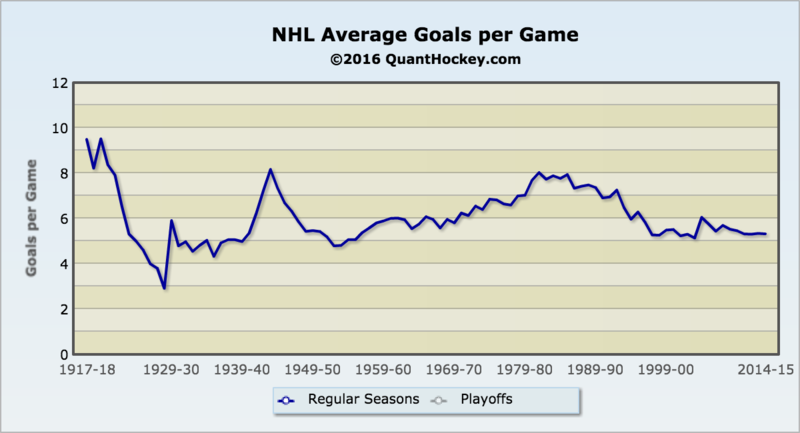 Of course, the amount of goals scored every NHL game has fluctuated a lot over time. This is largely due to the change in the size of goaltenders. 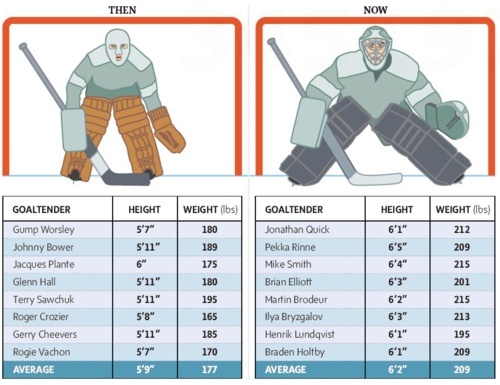 Goalies are now both taller and have bigger equipment. Players have less net to shoot at, and it is a lot harder to score. That’s why it is important to take this into account when comparing forwards who played at different times. By looking at career goal per shares, it’s unfair to make comparisons between players. For example, Mike Bossy only played from ages 20-30, while Gordie Howe played an NHL season at age 52. This would put Howe at an obvious disadvantage; he played a season well out of his prime, while Bossy played nearly his entire career during his prime. We need to account for aging curves. Simply put, I am only comparing the prime 800 games of each player’s career to determine the best goal scorer in NHL history. The numbers in the table below represent the highest 800 game average Goal Share Per Game they achieved in their career. I am using 800 games as the benchmark number because Ovechkin is currently 800 games into his NHL career. Most fans are interested in seeing where he ranks amongst the all-time greats. I’d like to note that Bossy only played 752 career games and Bure only played 702 career games, so I had to take their entire career numbers. As you can see, Lemieux leads the way with the highest Goal Share Per Game. Alex Ovechkin is up there as well, with the second highest Goal Share Per Game. Bobby Hull sits in third place. The extremely high-scoring eras Kurri, Bossy, and Gretzky played in certainly did not help their Goal Share Per Game numbers. 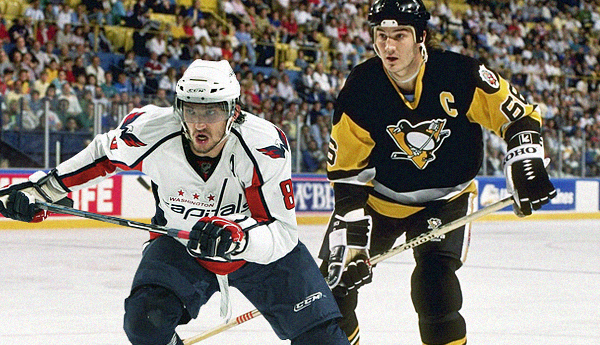 Among the highest single season goal shares per game, Mario Lemieux had a Goal Share Per Game of 15.9% over 60 games played in 1992-93, and Phil Esposito had a Goal Share Per Game of 15.6% over 78 games played in 19970-71.
Who is best goal scorer in NHL history? He may be 10th on the NHL All-Time Goals Leaders, but I truly believe that Mario Lemieux is the best goal scorer in NHL history. Not only does the data support that, but it’s facts such as the following that leave no doubt in my mind. After battling cancer, chronic back pain, and tendinitis throughout his career, Lemieux retired in 1997. However, he unexpectedly came out of retirement in 2000, and after missing 3 full seasons, the 35-year-old Lemieux scored at nearly a goal-per-game rate, recording 35 goals in 43 games (this was the highest goals-per-game average that season). It was also good for an insane 14.76% Goal Share Per Game. I have attached the excel spreadsheet I used to make all of the computations. GPG = Goals Per Game. The boxed areas represent the prime 800 games of their careers; only this area was used to calculate the Goal Share Per Game for each player shown in the table above.